NEW FEATURE: a Broadcast Official Nationals Program Ratings chart which includes final Total Viewers for each show. We have a limited ability to make revisions to the format (a side-by-side comparison of morning and afternoon ratings isn’t doable, for example), but would appreciate any thoughts and comments. ABC had the night’s MONDAY NIGHT FOOTBALL simulcast preemptions, and that sent the network’s adjusted numbers down sharply, by 0.3 for DANCING WITH THE STARS and 0.4 for CASTLE. On CBS, THE BIG BANG THEORY gained 0.2 and LIFE IN PIECES lost 0.1, leaving PIECES at only 50% of BIG BANG’s 3.8 final rating. 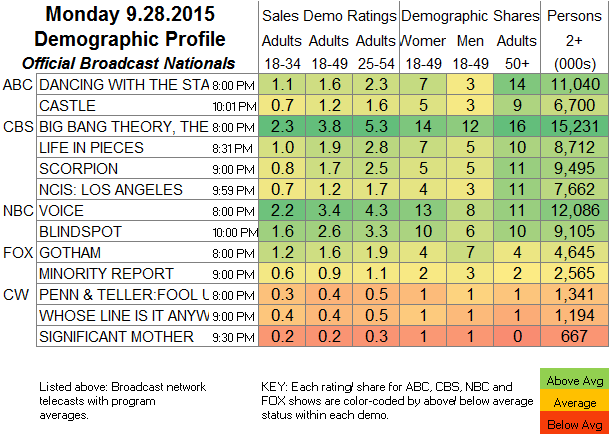 THE VOICE gained 0.1 in final numbers, and BLINDSPOT held its morning rating, as did MINORITY REPORT. As for the rest of the world, they were watching MONDAY NIGHT FOOTBALL on ESPN, which was up 0.48 from last week’s game to 5.13. VH1’s LOVE & HIP-HOP declined 0.07 to 1.37, BLACK INK CREW gained 0.07 to 1.17, and SHE’S GOT GAME was at 0.88. USA’s WWE telecast was at 1.22-1.09 over its 3 hours, compared to last week’s 1.18-1.10. On Bravo, REAL HOUSEWIVES OF ORANGE COUNTY edged up 0.02 to 0.81, while LADIES OF LONDON lost 0.02 to 0.39. 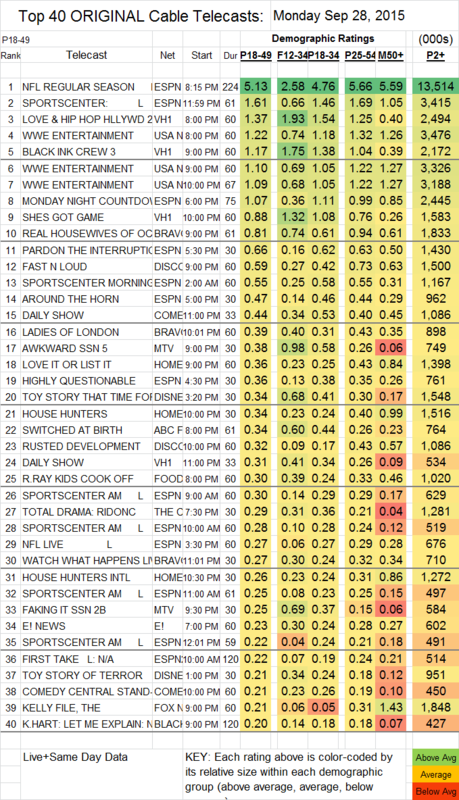 On Discovery, FAST N LOUD was up 0.04 to 0.59, and RUSTED DEVELOPMENT also gained 0.04 to 0.32. On MTV, AWKWARD had a good night, up a tenth in 18-49s to 0.38 and up 0.23 in F12-34s to 0.91, while FAKING IT rose 0.04 to 0.25 (and 0.19 in the target demo to 0.69), GIRL CODE LIVE dropped 0.04 to 0.10, and TODRICK was up 0.03 to 0.09. On ABCFamily, SWITCHED AT BIRTH was up 0.07 in 18-49s to 0.34 and up 0.11 in F12-34s to 0.60, while the season finale of CHASING LIFE was respectively steady at 0.19 and down 0.05 to 0.31.